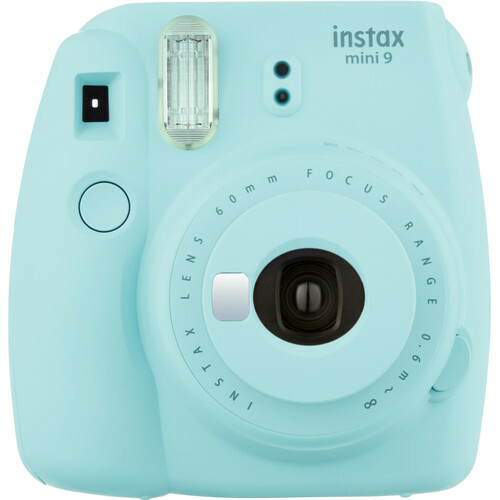 A compact instant film camera, the ice blue INSTAX Mini 9 from FUJIFILM has been updated for selfie shooters and features a range of convenient controls for producing credit card-sized prints. The sleek design incorporates a FUJINON 60mm f/12.7 lens, which offers a fixed focus from 2' to infinity, and a small selfie mirror is built into the front of the lens design for accurately composing self-portraits. Alternatively, a macro attachment lens is included to reduce the minimum focus distance for working with close-up subjects. For general shooting, the optical viewfinder is available and incorporates a central target spot to aid in composing images. Box Dimensions (LxWxH) 6.25 x 5.05 x 2.95"
INSTAX Mini 9 Instant Film Camera (Ice Blue) is rated 4.7 out of 5 by 102. Rated 5 out of 5 by Michael from Fun camera Inexpensive fun instant camera that shoots great little pics esp. close-up subjects. Almost useless for landscapes but that's not what it's intended for. The pics are great to shoot and then give away. The camera is what it is - easy and fun to use, great conversation starter, a supplement to a real camera. Probably a fun gift for a kid 10 or up but be careful as each pic costs between $.60 - 1.00 depending on type and quantity purchased. Rated 4 out of 5 by Pam D. from Fun Camera! I bought this for my daughter. There is a slight learning curve. Our dogs are a light color so the flash blows out the highlights very easily. Fortunately you can dial it down a notch or two depending on the circumstances. She likes the closeup lens; it seems to do better with the flash...doesn’t seem quite as harsh. With the close up you can get within 1 - 2 feet of your subject. You have to be a minimum of 2 feet with out it from your subject. Holding it steady was a challenge at first. There may be a slight lag between depressing the shutter and actually exposing the paper. This will be great for parties or group gatherings. I bought the white one for myself! Very nostalgic! Rated 5 out of 5 by m from My kids loved it Great? price point, received quickly and my kids loved it. Bought one for my 8 year old and one for my 12 years.? Bundle pricing for camera, bag and film was the best we found! I was extremely happy with the purchase! Rated 5 out of 5 by Marriah from What a fun camera. Came the day it was said to come. Fun camera for teens especially. Now she has pictures hanging everywhere in her room. I will be buying another one soon for my 9 year old. When will the camera be shipped? If you order before 4:30 pm EST most Mondays - Thursdays it will be shipped the same day you placed the order assuming we have it in stock. Im from Per. Whats the price for sending the camera? Can we convert photos from iPhone to instax mini 9 and come out as polariod? do the photos print right from the camera or do I need to buy a printer? No, the pictures print right out. Does it come with film?if so,how much? I just ordered this! It does come with the wrist strap that all other stores include in the box correct? Answered by: Marcelo Cotur C.
Tried using this camera but for some reason pictures I take don't turn out. why? The film could be bad. After taking the photo, it says to leave it in a dark pls eve while it develops. Unused film is supposed to be stored in a cool place as well. That's all I know (lol) I haven't used my own camera yet. I got it for my wedding guest book.